I flew into Fort Lauderdale after work on Friday night, arriving at about 10:30pm. 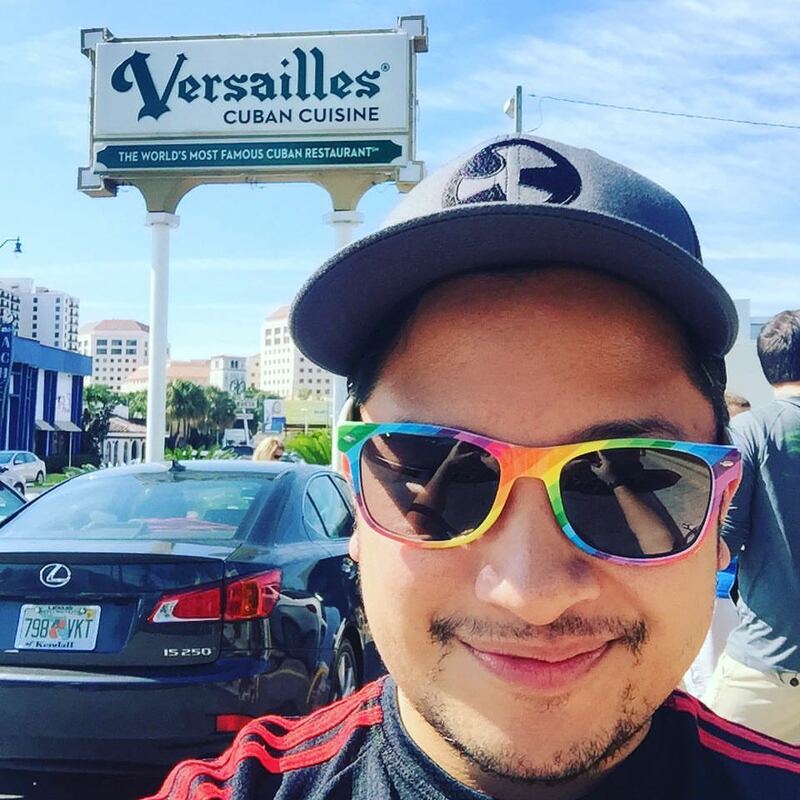 Seth picked me up at the airport and we headed back to his apartment in Wilton Manors. 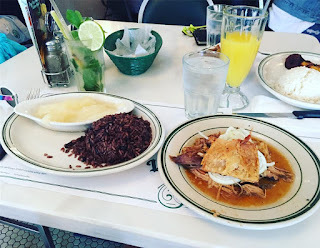 The following morning, we slept in a bit before heading out to the expo at Marlins Park in the Little Havana neighborhood of Miami. 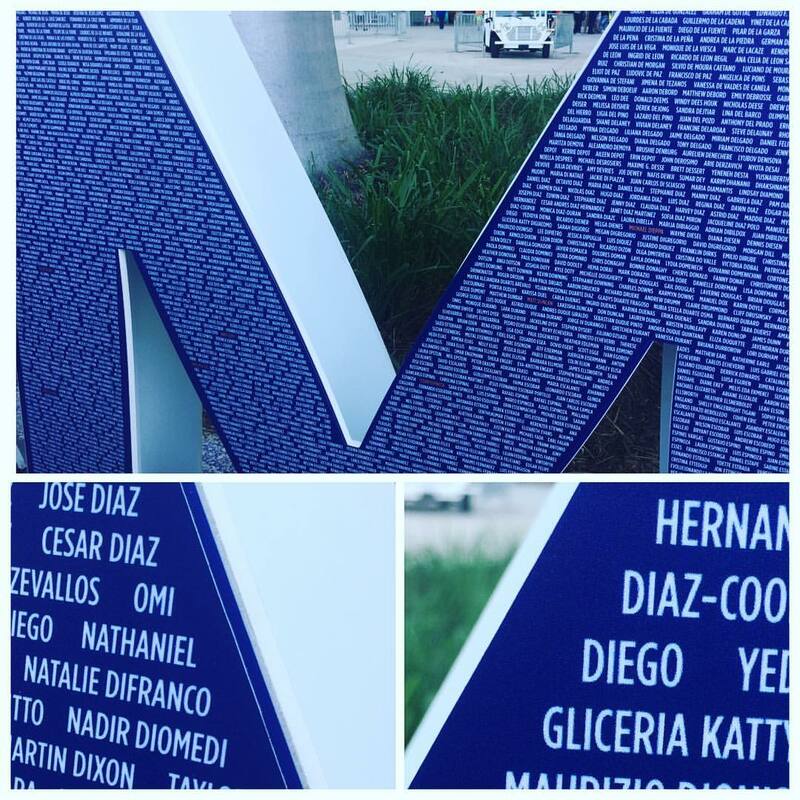 Upon arriving at Marlins Park, I notice a couple standing on the corner, one of them looking oddly familiar. The woman was Alison Morris, reporter for Fox News 5 in New York City, who I met in October last year, when she was mistress of ceremonies for my work’s annual gala event at the Ritz Carlton in Manhattan! When I was introduced to her at our event, I found out she and her husband were both avid marathoners like me! 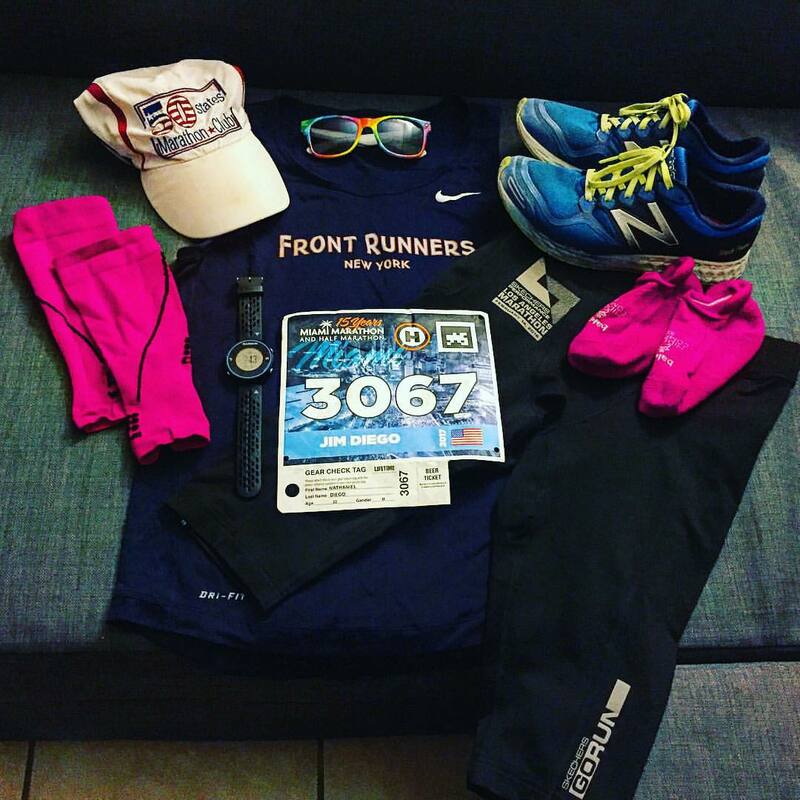 She and her husband on a whim decided to fly down to Miami just earlier that week to run the half marathon! 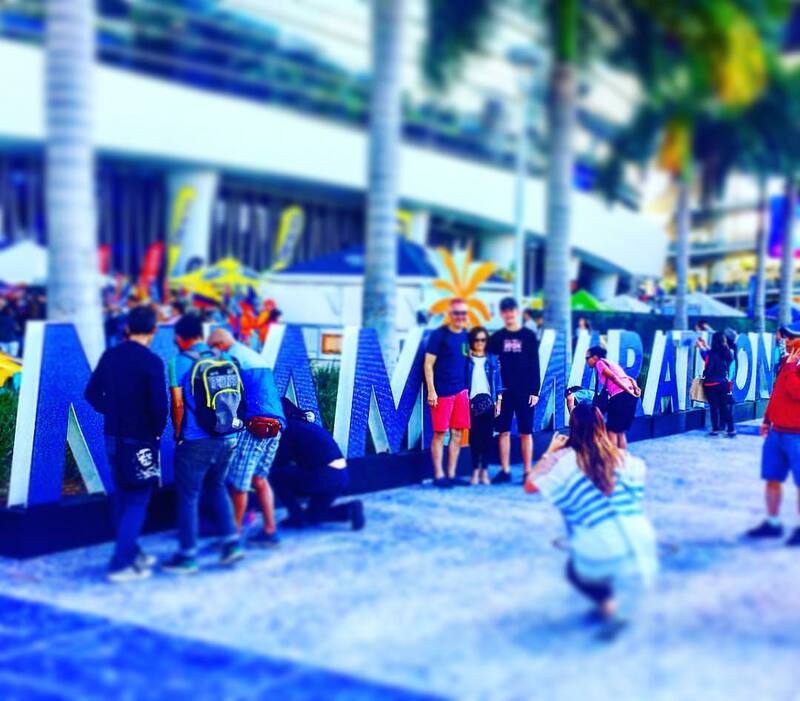 Miami Marathon sign, to be posed with for photos! 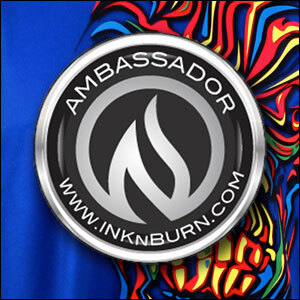 Huge version of the medal I'm about to get! 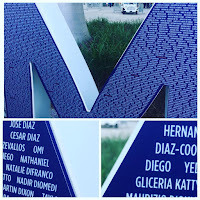 We then decided to proceed into the expo itself to get our bibs… quickly realizing that there was a MASSIVE line to just get into the Marlins Park, wrapped around the outside of the stadium! The lengthy line weaved through the outside booths, and was held up because all expo attendees needed to proceed through metal detectors... WOEFULLY inefficient. We then had to head up ramps to the concourse level of the stadium, where we were led through a quasi-labyrinth of booths to pick up our bibs, and then up a level by escalator to retrieve t-shirts. The lines and the crowdedness made this expo feel quite cramped, and my feelings were similar to many others attending. It turns out this is the third location in recent memory to hold the health and fitness expo for the Miami Marathon in recent years - after several years at the Miami Beach Convention Center, and then at the Miami Design Center in the Wynwood neighborhood of the city. Chalk it up to wanting to show off the brand new stadium, which had just opened in 2016, perhaps? 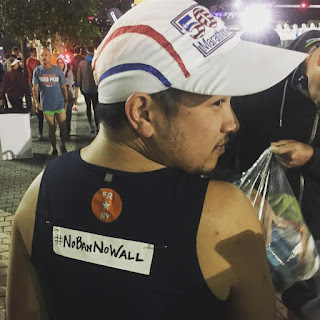 Someone mentioned that the location last year was not available - and we also found out there was major construction happening at the convention center, so this was a possible last resort. What the reason was, I never found out - but it was definitely a bit of a disaster of an expo. Other than being able to retrieve a replacement watch band for my Garmin, I sped out of that place as quick as I could after I got my bib and t-shirt. 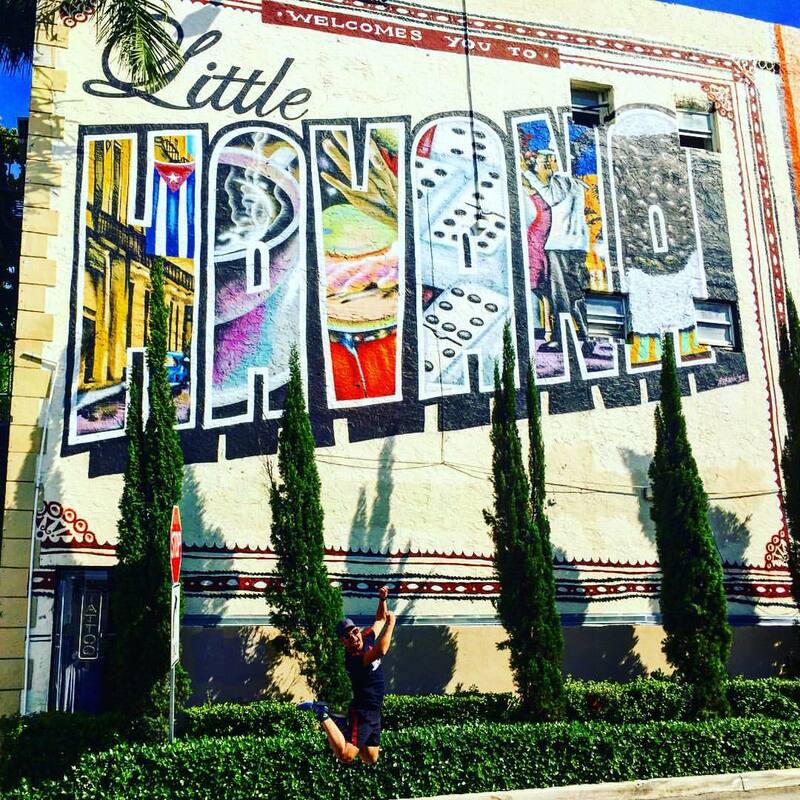 Little Havana, jump for joy! Front Runners from NYC and FLL! VERY early the next morning, we woke up at 3:30am, and with Seth's friend, Fort Lauderdale Front Runner Paul, we took off just after 4am to head down to Miami for the race which had a 6:00am start time. We were able to get down to the Miami area very quickly, but once we exited off the highway, it got to be a little more traffficky as we approached parking near the start area. It was funny to see people leaving the clubs as we were heading to parking - just as we were getting our day started! We promptly were able to find parking a couple of blocks away from the front of the American Airlines Center, and went about our business to do what we needed to do before the race. Social Justice along the route. Lots of people in this heavily immigrant place appreciated the support! The startline, before the rain. 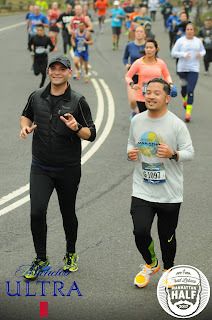 As we were getting ready to go into the corrals, I spotted fellow FRNY members Michelle and Devon, who I hadn't seen in awhile and didn't realize were also running the race. I headed up to the front of the American Airlines Center and then found another FRNY member, Marcus. We had talked about running the race together, so we headed back down to the corrals; while I couldn’t join Marcus in his corral a few letters forward, he decided to start with me back in corral H.
Assembled together, Marcus, Seth, and I watched as several corrals took off. Finally, it was our turn. We were prepared for a potentially wet morning, but the rain hadn't started - yet we could feel the saturation of humidity in the atmosphere. Quite literally, as soon as we crossed the startline, it began to rain. And it wasn't just a little rain... it was torrential. 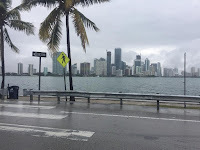 We made our way up Biscayne Boulevard and onto the MacArthur Causeway, running past the cruise ships docked in the Port of Miami as the rain came down. 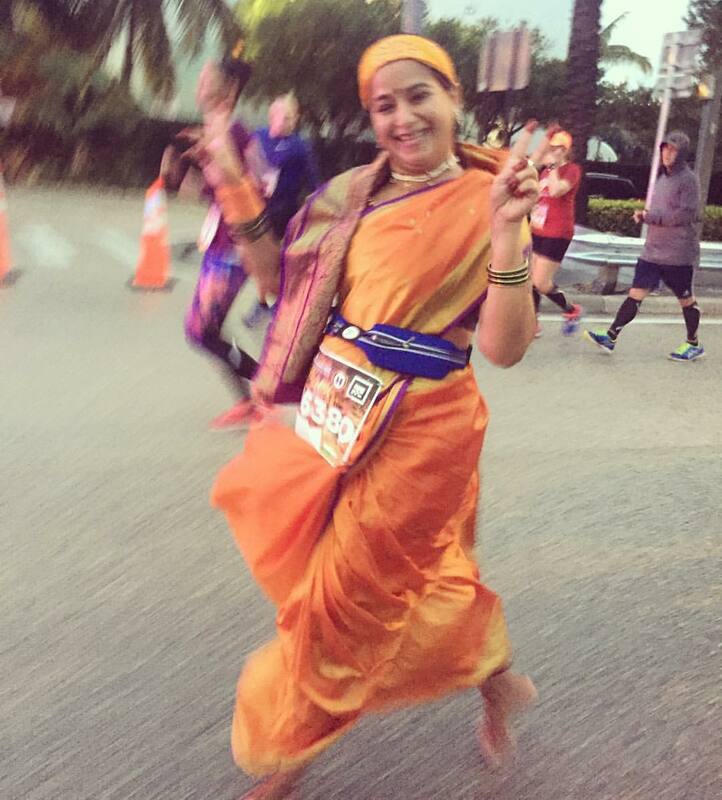 Along the way, I spotted an Indian woman wearing a full sari and running barefoot. I spoke with her quickly in the opening miles - her name was Nilima, and running her first marathon, and just beaming with pride. 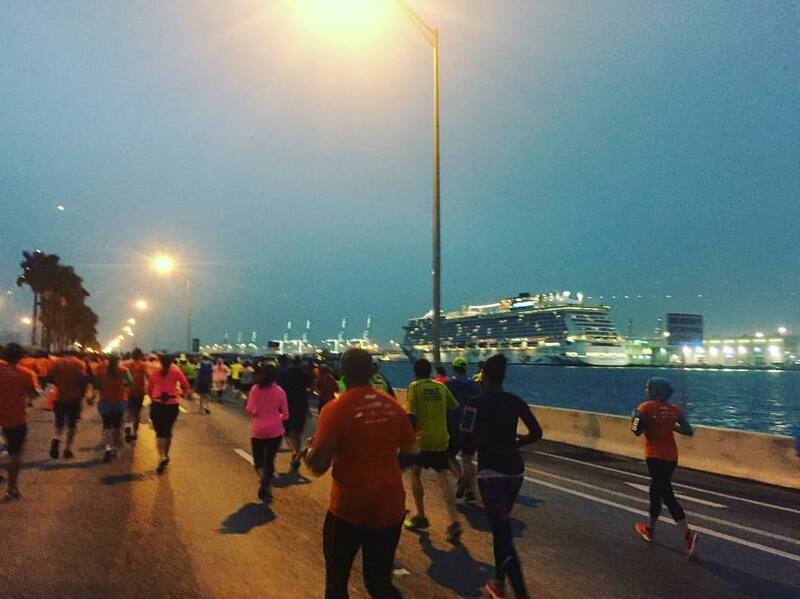 The stretch was lengthy - over three miles running along this causeway in the middle of Biscayne Bay. Eventually, we got off the causeway and ran into Miami Beach. All the while, the three of us continued a consistent 9 minute run, 1 minute walk. We would end up doing this for the first 14-15 miles. 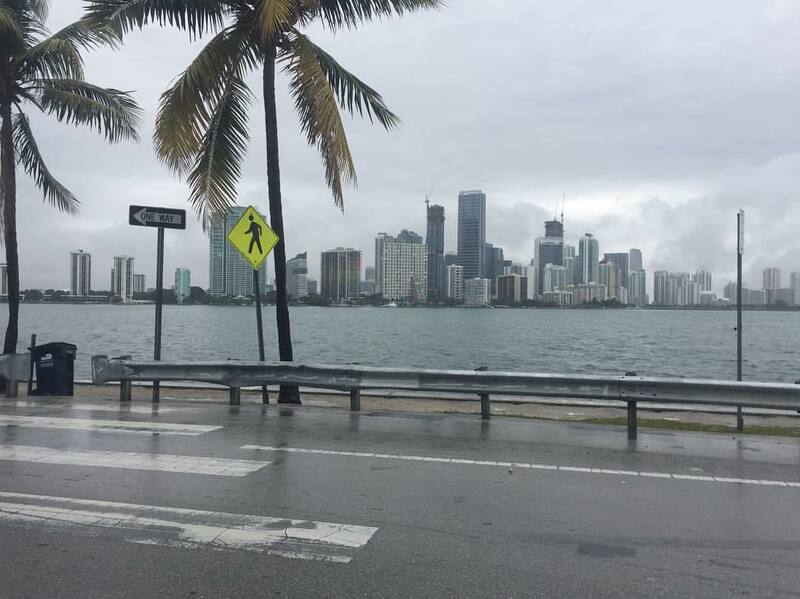 We continued through Miami Beach, able to stretch out a little bit as the road widened, and the rain turned into more of a drizzle. Still, people were out there, umbrellas in hand and ponchos adorned, cheering us on in this less-than-stellar weather. 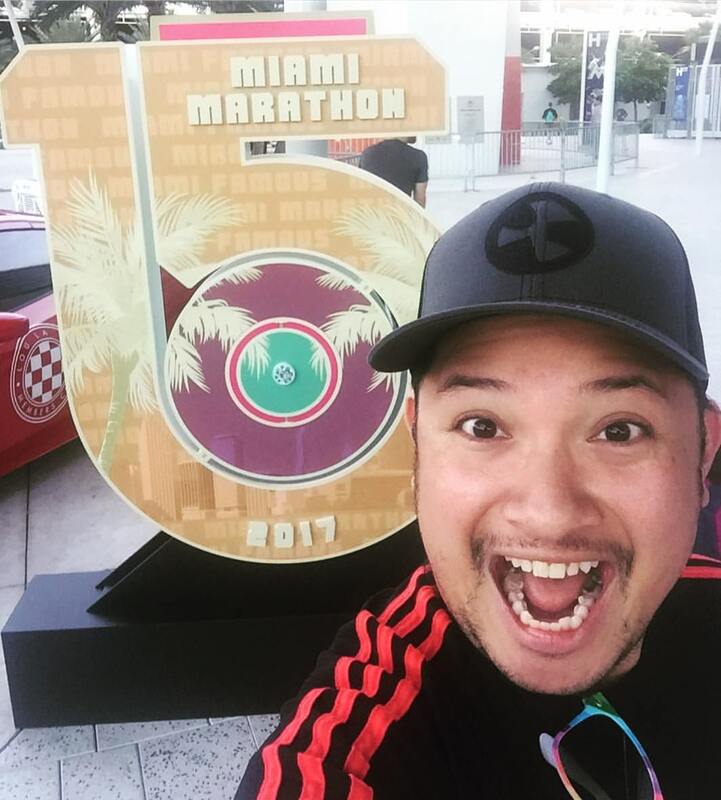 Mile 4 passed, as we ran down Alton Road, curving around South Pointe Drive to Ocean Drive, the main drag along Miami's famous South Beach. The vibrancy from yesterday's walk along the ocean was a bit more somber under the clouds greying out the sky, and it was a bit more quiet. Perhaps because it wasn't even 7am yet? After running about 1.25 miles along Ocean Drive, we turned left onto 14th Street, and found ourselves on the out-and-back stretch in Miami Beach along Washington Avenue. 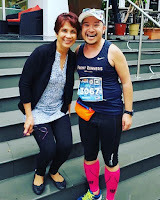 Seth managed to find a couple fellow Marathon Maniacs he knew and even our mutual friend Loan, but I didn't see her sadly, as I seemed a bit too focused on ensuring I was keeping up my run/walk pace alongside my two friends. We progressed up treelined Washington Avenue, before turning left onto 17th Street/Hank Meyer Boulevard making our way back to downtown Miami by way of the Venetian Causeway. 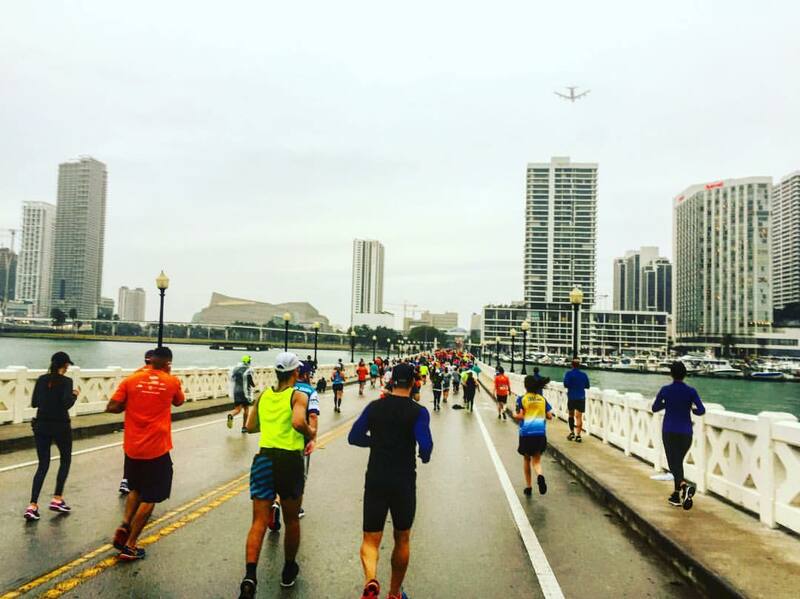 We ran over the manmade Venetian Islands, seemingly offered a suburban feel despite being completely surrounded by the waters of Biscayne Bay. 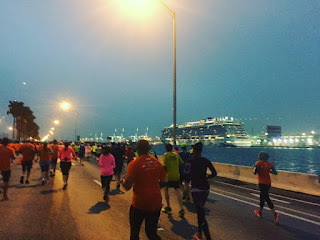 We gingerly made our way over a couple of super slippery drawbridges (obviously down for the runners), but still maintaining a couple even 10 minute miles, as the skyline of the Media and Entertainment District came closer. 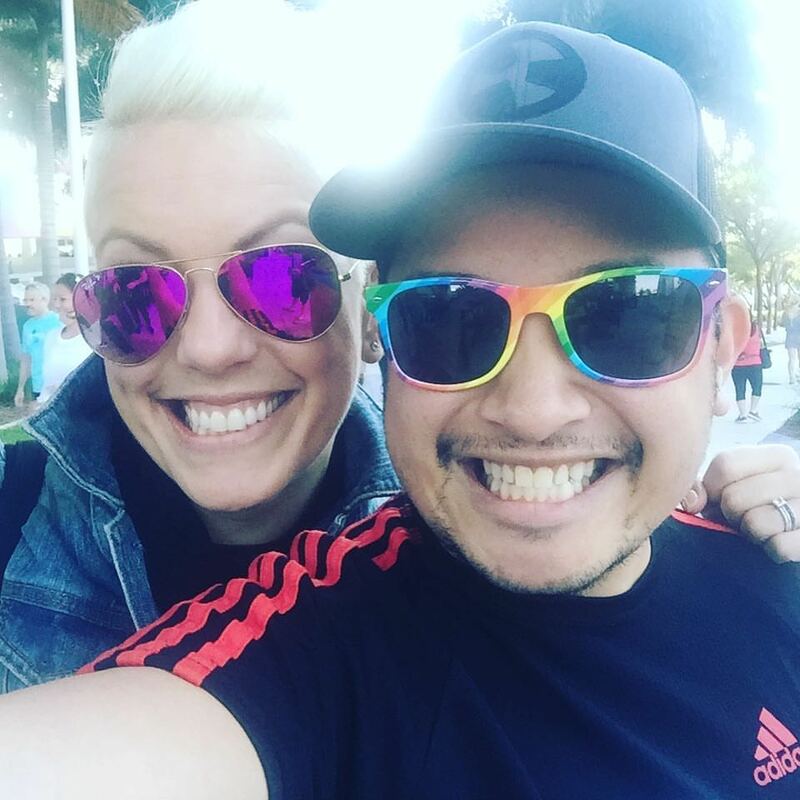 Directly in our line of sight was the Adrienne Arsht Center for the Performing Arts, Florida's largest performing arts center, and the pedestrian bridge that connected it to its People Mover station across the street. We continued westward, before turning north onto NE 1st Avenue, looping around NE 17th Street before heading south onto Miami Avenue, the east-west division of the Miami-Dade County grid plan, making our way through the thick of Park West (a neighborhood of highrises with some future development potential) and downtown Miami. We turned left onto Flagler Street, the north-south divider and the primary commercial strip of the commercial business district. We turned right onto SE 3rd Avenue, and from there, the half marathoners broke away from us to continue onto the finish... we still had another half marathon to go, progressing further south. Eventually from here on to mile 21, we began to do a 4 minute run, 1 minute walk. After that, it was more of a free for all, making walk stops whenever I needed it all the way to the end. As we broke away from the half marathoners, we turned right again onto SE 2nd Street, and immediately, it was a lot more quiet and the roads were much more roomy with less people to encroach the street. We were running under overpasses and there was a lot of graffiti everywhere. 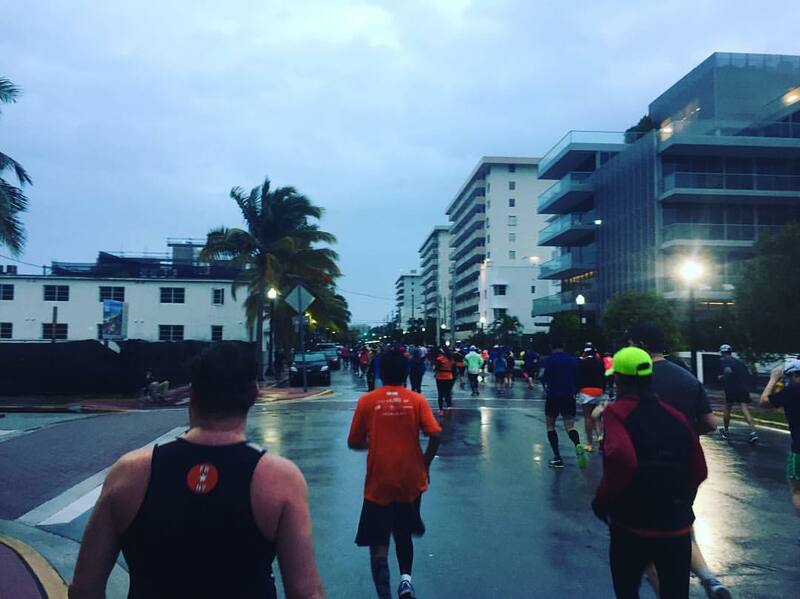 We turned left onto SW 2nd Avenue crossing the Miami River, and then began our progress down into Brickell, an area we would pass through twice on the marathon route. Eventually, we found our way onto Miami Avenue again, on a stretch that would take us out into the neighborhood of Coconut Grove. It was far more residential in this area, and there were a few more "unofficial" aid stations along the route, including a MUCH needed pineapple stop at mile 16. Along the way, we passed the entrance to the Vizcaya Museum and Gardens, a much-photographed early 20th century estate built in the Veneto and Tuscan Italian Renaissance and Mediterranean Revival style. We would eventually turn onto Samana Drive (a street I remember because I've vacationed to the "original" Samana in the Dominican Republic! 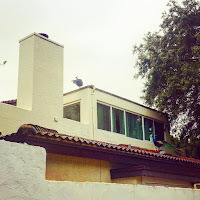 ), and run through the quiet residential Bay Heights area of Coconut Grove. 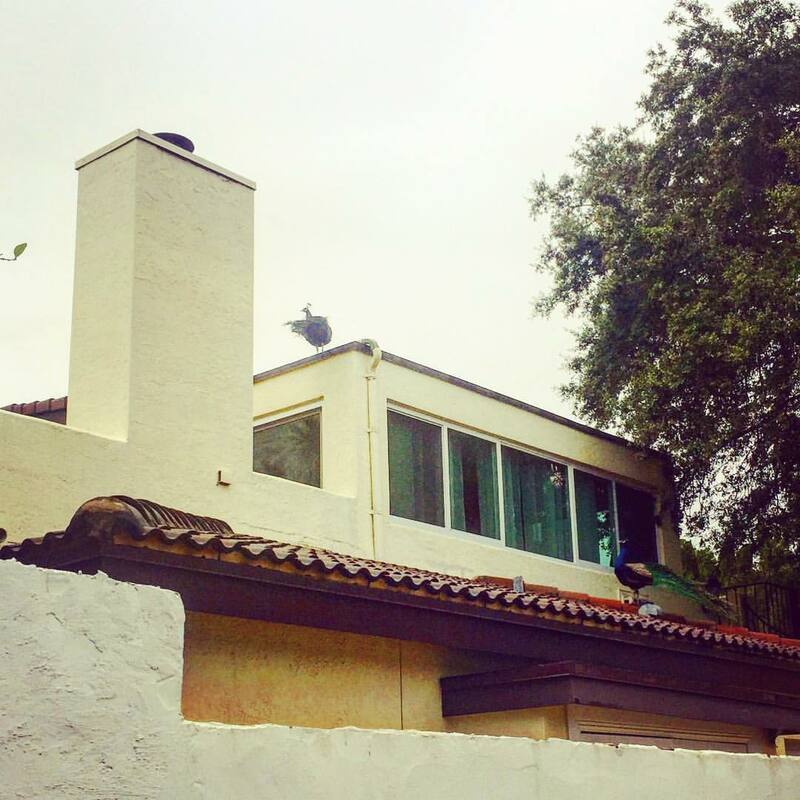 Interestingly, several homes had wild peacocks randomly wandering about on yards and rooftops. 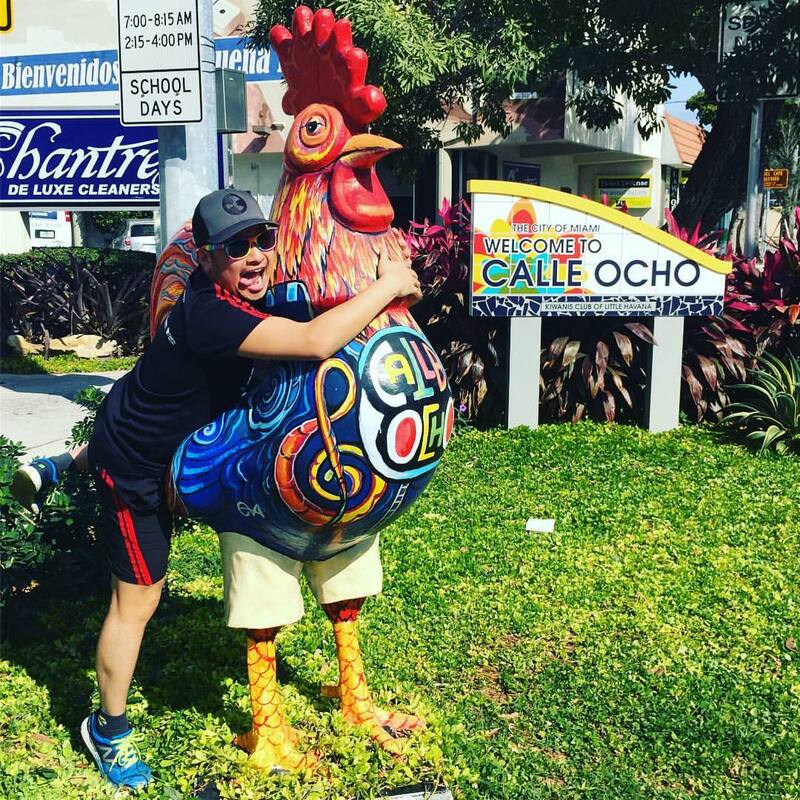 Peacocks have apparently roamed Coconut Grove for as long as anyone can remember. 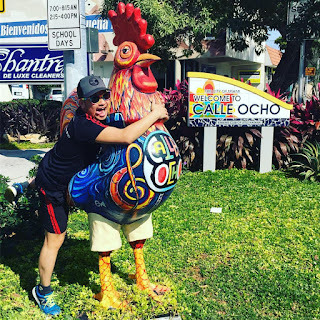 No one really knows how they got here -- they may have been introduced as a marketing gimmick by hotel developers in the early 1900s, or a local couple bought a pair as pets, and nature just took its course. They're actually a source of controversy in the neighborhood with many for and against their existence in the neighborhood. 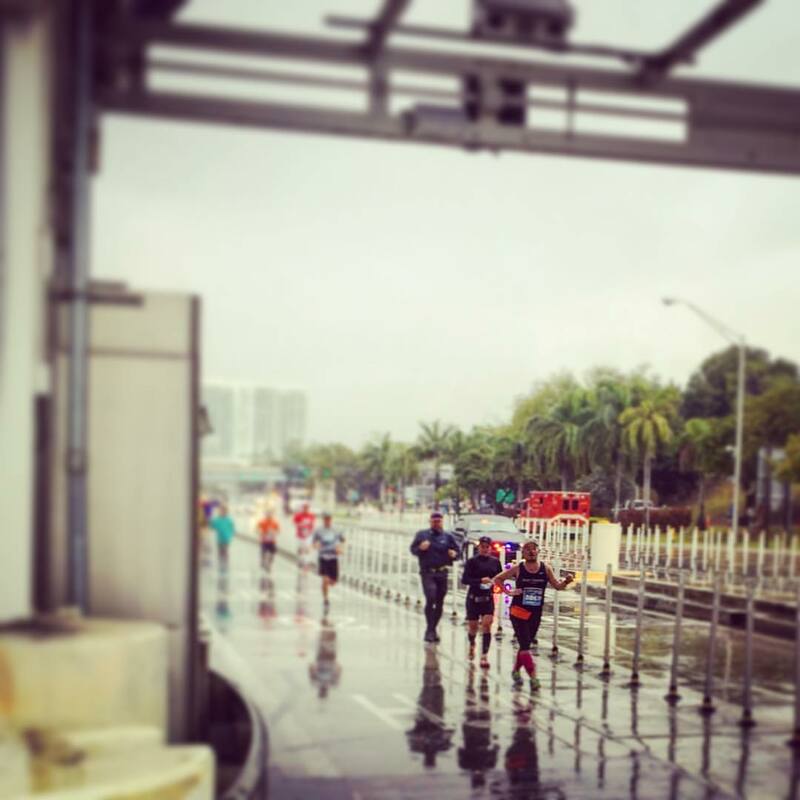 Because the Miami Marathon is such a huge event, the Miami Police Department enlists the help of neighboring community's police forces for course enforcement. 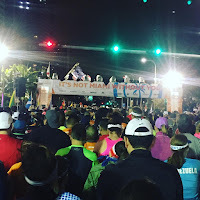 As we rapidly approached the 18 mile mark on Tigertail Avenue, we noticed police cars with "Hialeah" emblazoned on the doors randomly patrolling here, specifically for the race - notably, we were nowhere near Hialeah. 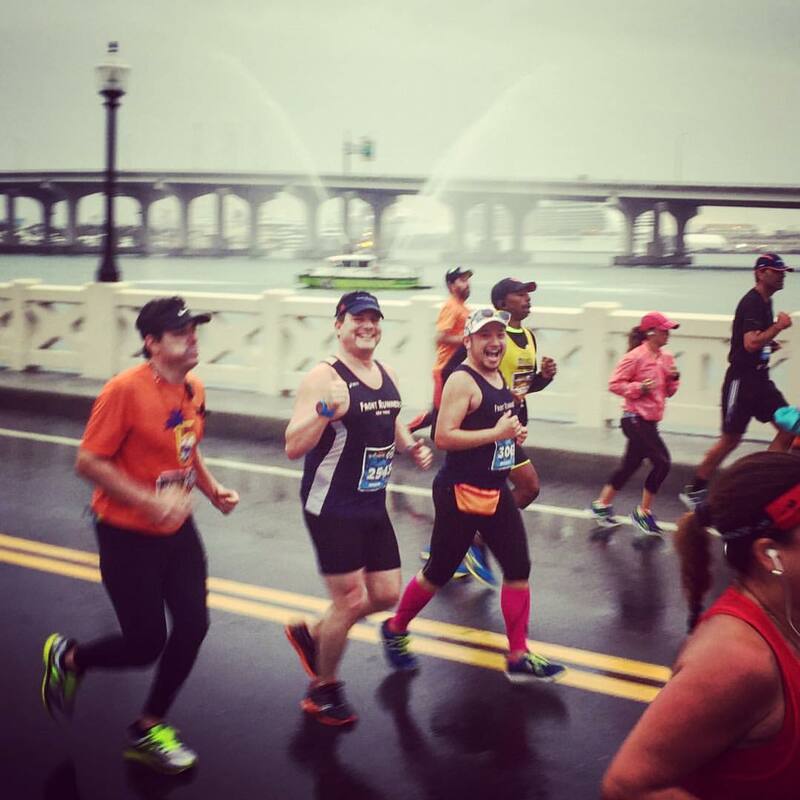 While the neighborhood was quiet during the race (likely due to the rainy weather), we still had revelers out cheering us on, like Marathon Maniac Heather, who was handing out ice pops and covertly handing out beer to runners at this critical juncture of the race. 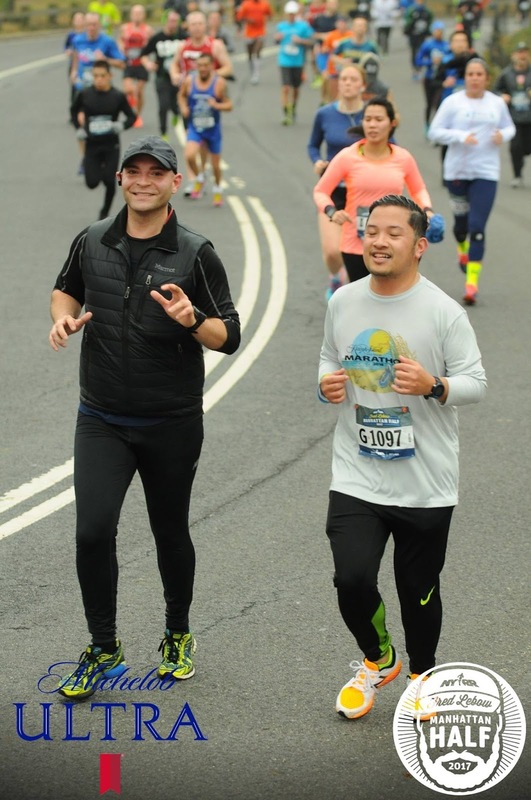 Despite slowing down, we were still making good time, and the three of us began to play leapfrog with the 4:45 pacer from mile 16-20. Eventually, he made his way past us, but we were not too far behind. 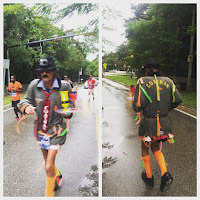 We also ran alongside the South Florida mainstay runner "Coatman" wearing his winter coat, colored streamers, big red tie, fedora, knee high neon socks, and black wingtip dress shoes, while carrying a tray topped with a bottle and glass, waiter-style. He's one of America's most recognizable "stunt" runners, and has run every Miami Marathon since 1981, all while wearing this absurd outfit, as well as many other marathons around the world. 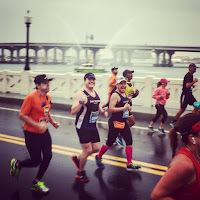 A little after the 18 mile mark, we turned and ran along the north shoulder of Bayshore Drive, as we saw other runners coming back in our direction. Finally, this long out section into Coconut Grove would be returning back toward downtown - but we couldn't tell how much further. 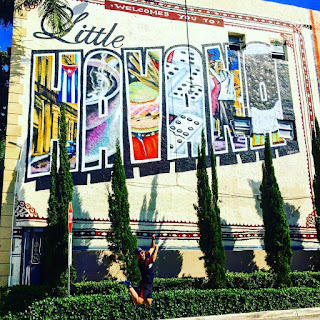 We took a slight right along Grand Avenue and passed through the neighborhood's main strip and the CocoWalk lifestyle center. It was nearly 10am, and the restaurants all along Grand Avenue were beginning to serve brunch... after having run nearly 3 1/2 hours, it was so mean, everyone was eating and drinking, and I was STARVING. 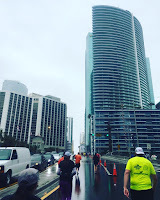 We made a sharp left onto Commodore Plaza, and zigzagged our way down to Bayshore Drive, and began our return to downtown - but of course, the weather decided to rear its ugly head and rain began to come down again like crazy again, starting around mile 19.5. 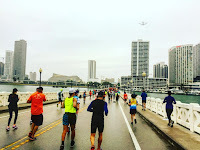 Of course, the 4 minute run, 1 minute walk plan started to disintegrate and Bayshore Drive passed by Bayside Park, Coconut Grove Marina, and David Kennedy Park. Boredom set in as Bayshore Drive turned into S. Miami Avenue and we passed by Mercy Hospital and the Vizcaya Museum again. 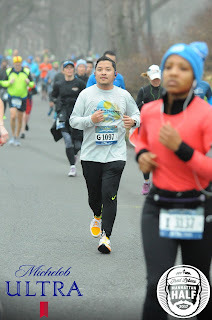 My right calf was starting to bother me, so I walked as I needed to. The long continuous stretch began to get monotonous, and thankfully a MUCH needed pineapple stop appeared at mile 22. Eventually we made our way to one last short out-and-back section that took us onto Hobie Island Beach Park along the Rickenbacker Causeway. As we made our way at the turnaround, we were offered with beautiful views of the downtown skyline. There were even the Muscovy ducks casually hanging out in the park - the same ducks that I saw in Baton Rouge, Louisiana only two weeks before. We headed back into Miami, reaching the 24 mile mark, and passing the causeway's tollpass booth, and then turned right onto Brickell Avenue. These last two miles were painful, though we knew we were almost to the end. As the skyline got closer and we slowly made our way past highrise after highrise in the neighborhood of Brickell, I heard a voice call out my name. To the right, taking cover from the rain, was my second cousin Brenda, and her husband Jeff! We had found out via social media that we would both be in Miami at the same time, and I gave her an idea of when we would be in the area where she was staying and lo and behold, they stuck around to cheer for me despite the less-than-stellar weather... and right where I needed it, just after mile 25, too! 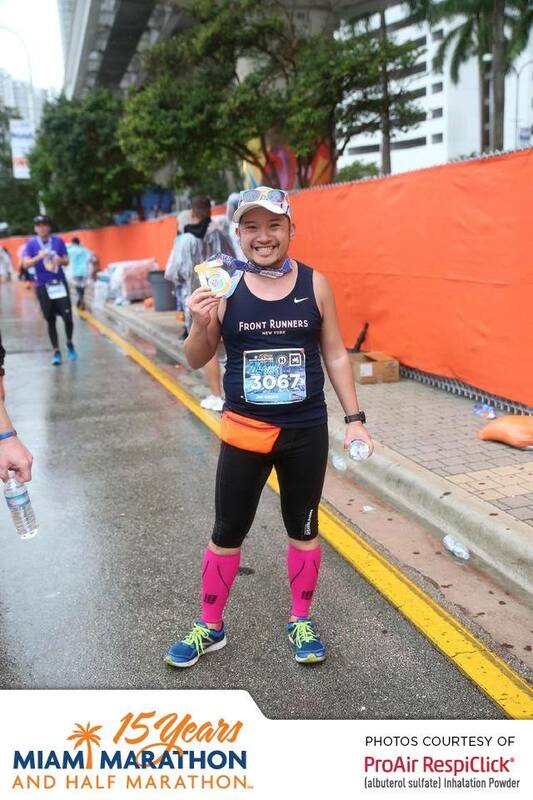 With only a little over a thousand meters left to go, we encountered the only real "hill" in the race - the SE 2nd Avenue Bridge that took us over the Miami River and even closer to the finish line. The hill... was only something like 7 feet of elevation change. In the shadow of more highrises that dot the downtown area, we made the final right turn onto Biscayne Blvd Way, all the way to the finish line in front of Bayfront Park. 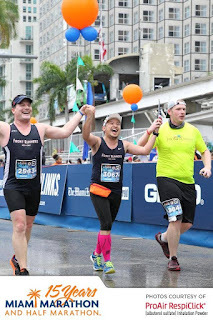 I crossed with my two friends, who stuck beside me the entire way, in 4:51:47 - then, my fifth fastest marathon time out of 27 marathons under my belt. 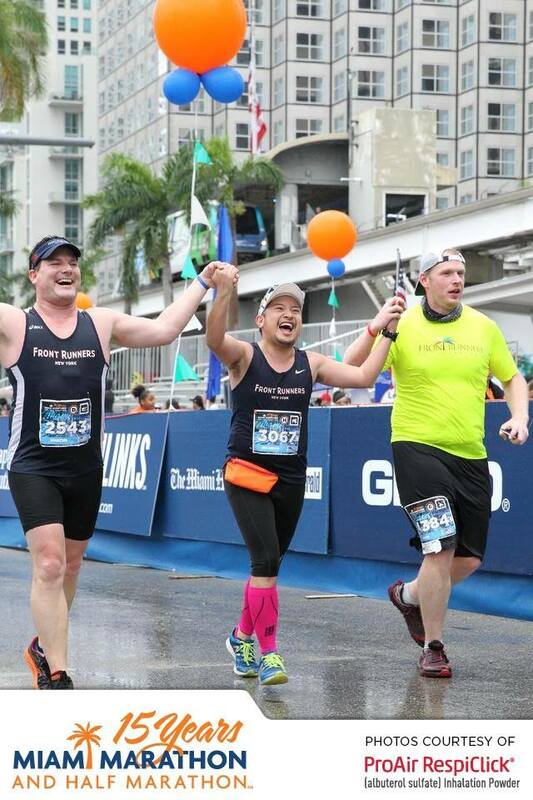 Incredibly thankful to these two guys for sticking by my side the entire race! We headed into the Bayfront Park to locate the rest of our crew who had met up at the startline, with the ground muddied from the intermittent rain and all the runners traipsing around. We found Paul and headed back to the car, stopping to take my traditional Victory Headstand photo along Biscayne Blvd with the Freedom Tower in the background. 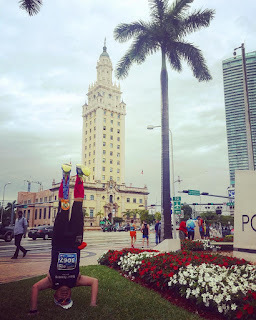 Miami's "Freedom Tower", was constructed in 1924 to house the newly united Miami Daily News and Metropolis newspapers, but it earned its name in 1962 when it became a processing center for Cuban refugees fleeing the Castro government. Seth drove us all back to Fort Lauderdale, and we had the rest of the day to relax before my evening flight home. Of course, it continued to rain all day. But, my trip wasn't over. Shortly after Seth dropped me off for my evening flight, I realized my flight had a delay on it. I thought, heh... no sweat, I'll just be late getting home. Well... that delay just got worse and worse. On the evening of January 29, Delta Air Liens experienced a systemwide power outage which grounded planes NATIONALLY. Only Delta flights already in the air were able to get to their destination, but who knew if they could even get to their gates. My 7:55 flight became delayed more and more. Luckily, I have a cousin who works for JetBlue, and after getting in touch with her, she was able to get me a seat on a flight back to the NYC area. I was extremely lucky - it seems that none of the passengers on my flight could get on this flight because JetBlue closes their ability to book online two hours before travel. I was able to get on the flight as a standby passenger thanks to her! It was already an hour delayed to depart due to weather in NYC, but I got a seat (middle, oh well) and headed home... but to Newark Airport, and it would arrive at the ungodly time of 1:30am. This meant, upon arrival there would be no AirTrain and no shuttles - essentially no ground transportation whatsoever except for cabs. I ended up sucking it up, and forked over $95 (crossing the tunnel into Manhattan is NOT cheap!!!!) for a cab ride to Times Square, then take the subway home. I finally got home at 2:30am. 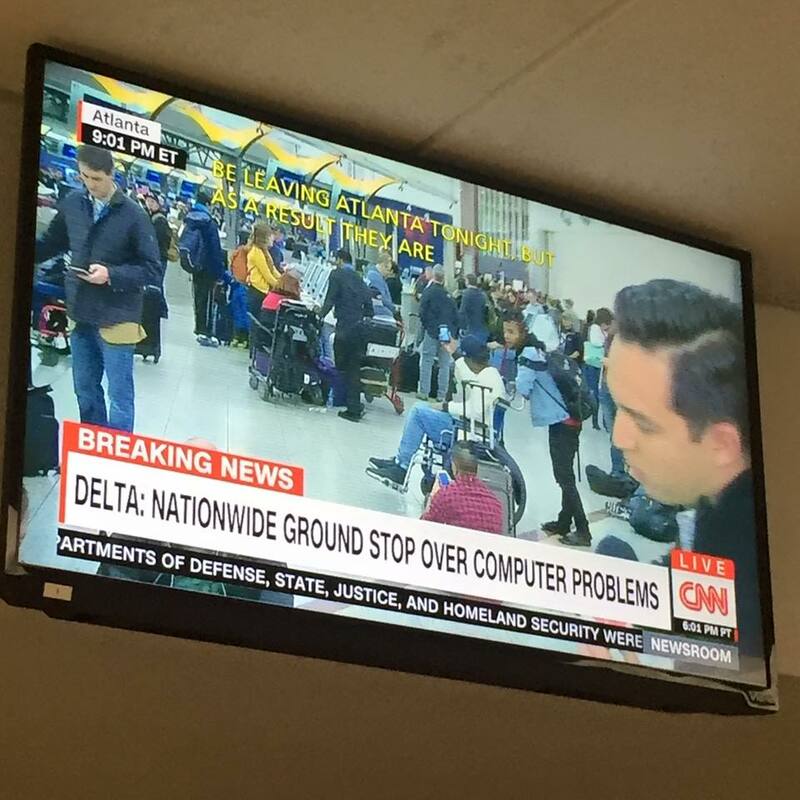 Delta grounds all flights nationally due to computer issues. Groggily, I woke up the following morning and somehow made it to work. I got ahold of Delta (after a hellish three hour wait) but I was able to get my return flight fully refunded AND got a $100 travel voucher for my cabfare. A few days later, Delta announced that they were giving out 10,000 SkyMiles and a $200 travel voucher for all those affected by the delays and cancellations on Sunday night. Despite my tiredness at the office and the stressful trip home, it was a winwin! 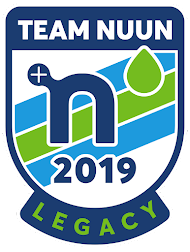 Before the weekend came, there was much speculation as to when an impending nor'easter was going to hit New York City - would it affect us on Saturday during the race, or would it be later? Or perhaps it would be later on Sunday morning? Or just miss us altogether? Well, Saturday morning for the annual Fred Lebow Manhattan Half Marathon was going to happen either way, as long as the wind wasn't going to be too strong to potentially down tree branches in the park. 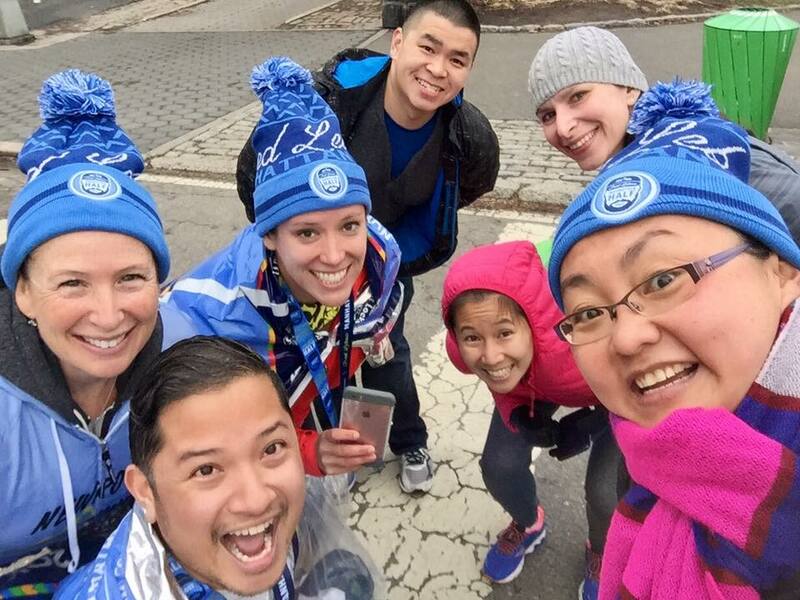 I left my apartment in Queens at 6:30, hoping to make it to the Upper West Side by 7:15 for a photo with my running club, Front Runners New York. After getting out of the train, the scene was FOGGY. 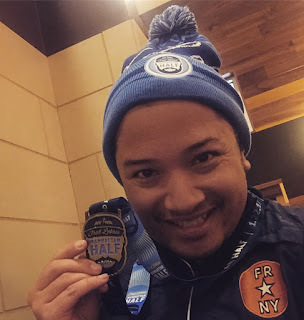 The temperature was about 43º, with 100% humidity - it actually reminded me of the conditions at the start of the Louisiana Marathon a week earlier, but twenty degrees colder. It was New York in January, after all. 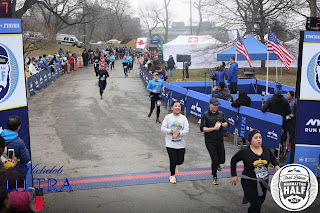 But this would be one of the warmest editions of this race on record, as in previous years it has been known to be bitterly cold, or even enveloped in snow or ice, sometimes even cancelled, so having the temps in the low 40s was an improvement! Baggage check for the race was on the 102nd transverse, but the race start was a good 1/2 mile further south on the rolling hills of West Drive, near 94th Street. 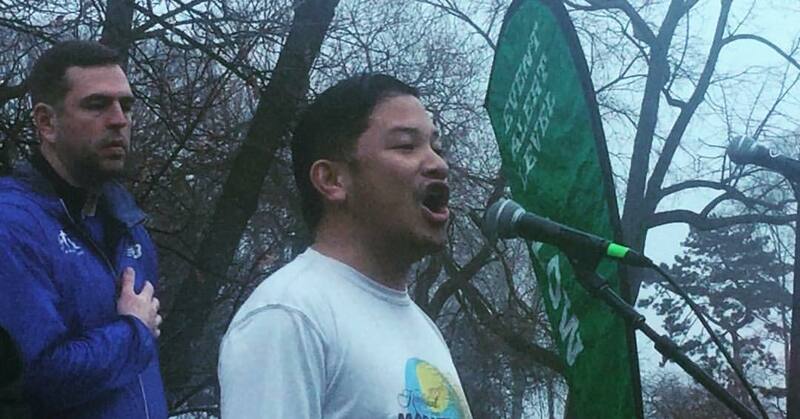 Despite getting my things together, I still felt like I was in a rush, but maybe it was because I was about to go sing the anthem for this race, and there was still a bit of distance between me and the start. 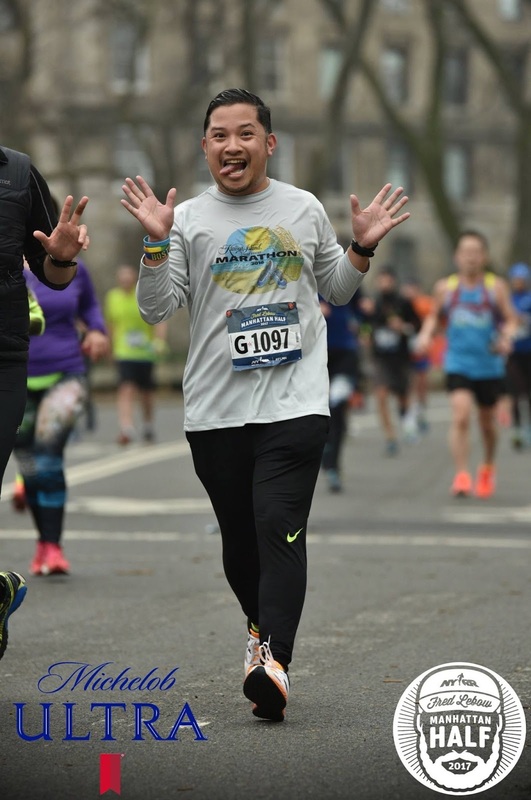 Ultimately, I did get to the start, and was even able to have the announcers add the fact that this race would be my 80th half marathon. 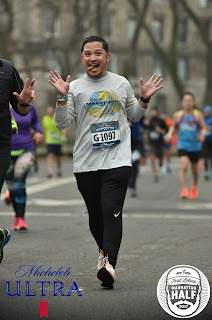 After a moment of silence to memorialize NYPD detective Steven McDonald, a friend to New York Road Runners, who had passed recently, I sang the national anthem, and then jumped into the corrals... As the race started, I stuck around on the side and waited for my friend JC who was pacing 2:15, and crossed the start line mat at about 8:07. Central Park is great and all, but for a distance race, repetition is required, as the course is made up of multiple loops of the park's asphalt paths to reach the 13.1 mile distance: in this case, from West 94th Street, two counterclockwise loops cutting off at the 72nd Street transverse and including the Harlem Hills, and then a third loop that cut left at the 102nd Street transverse to the finish. 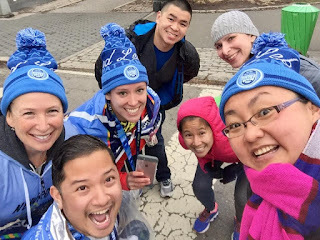 While I usually have a lot to say when it comes to race reports, the experience of running in Central Park is one that just needs to be experienced. 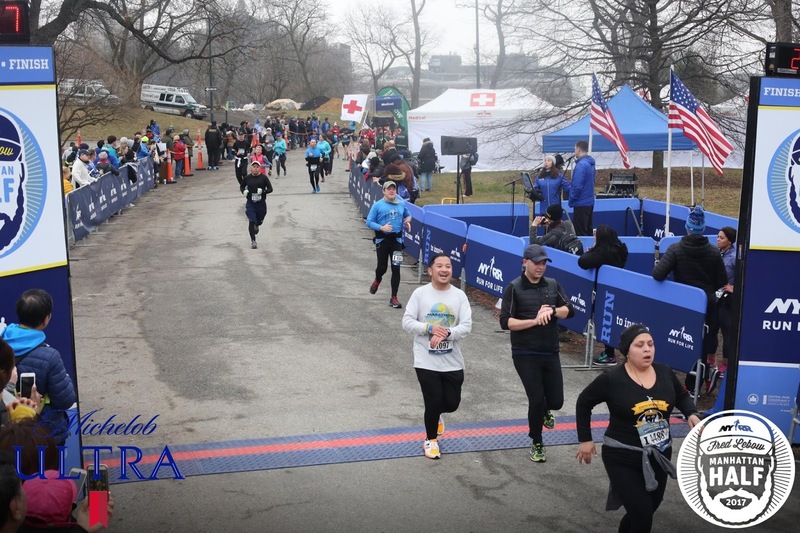 In short, it has its share of rolling hills on the west side, and then one significant hill ("Cat Hill") on the east side, before the Harlem Hills challenge runners on its tough uphill ascent in the northwest corner of the park. 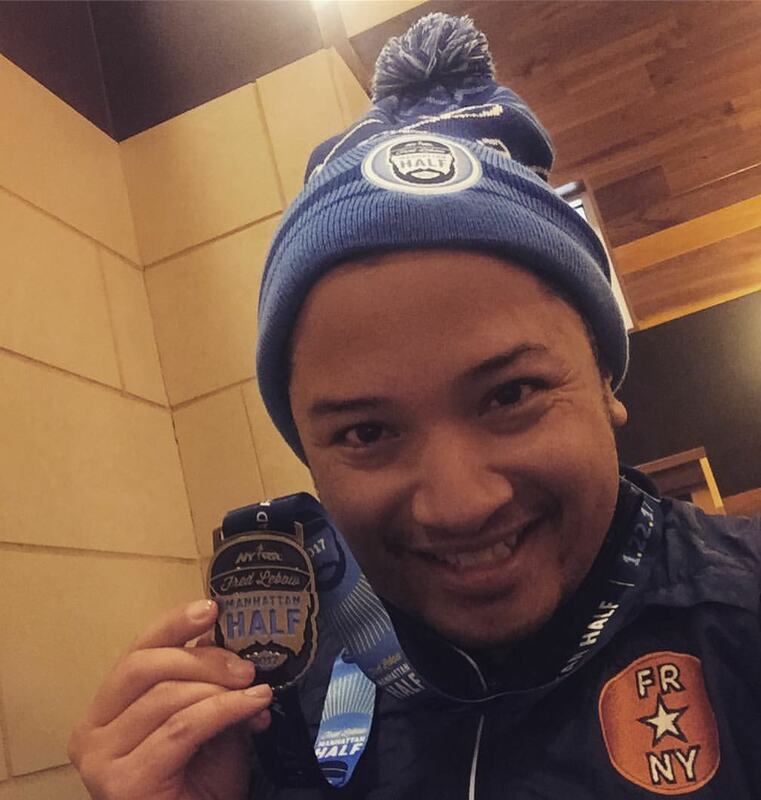 I've written about a half marathon in the park before, when I ran the 2015 NYCRUNS Frozen Bonsai Half Marathon, so if you're looking for a play by play about what you see running through the park, you can read that. 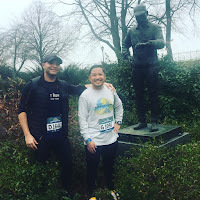 For this race, I had a pretty strong first 10k, running it in 1:00:30, en route to a sub 2:10 finish, but then at mile 8, I ran into my friend Ryan, who was having a tough go during the race. 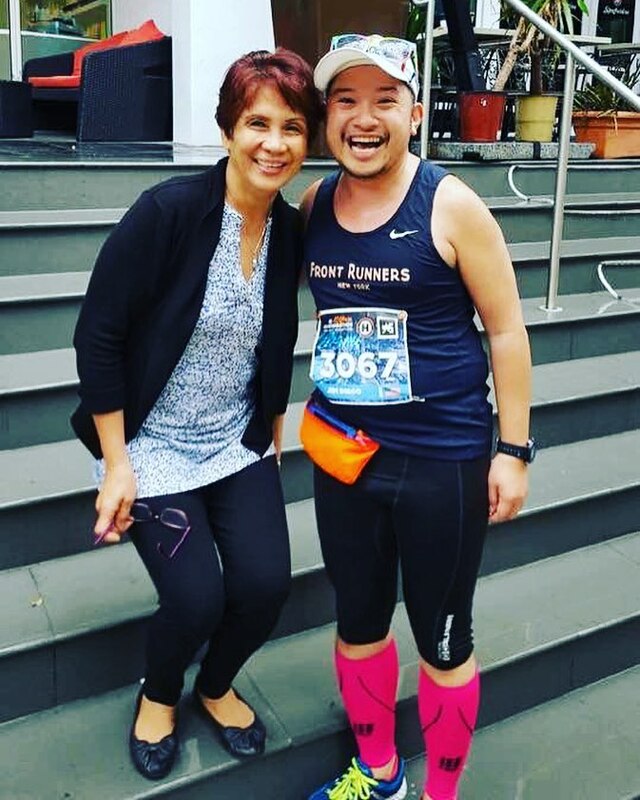 I made a decision to run with him for the last five miles of the race, as he had been pivotal in helping me complete my second loop of the San Francisco Marathon back in July. It was the least I could do. 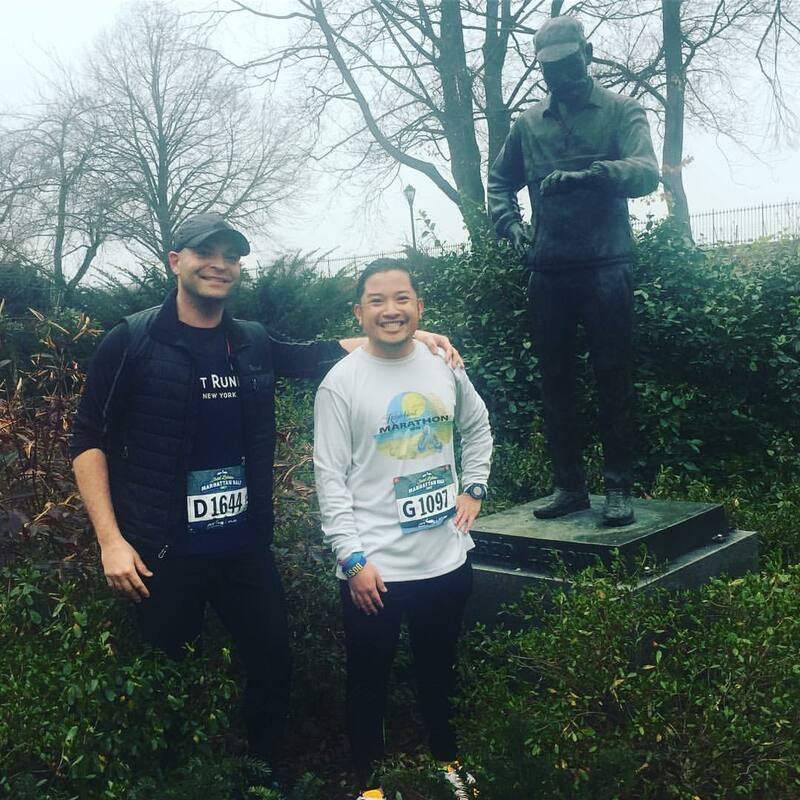 Before hitting the last 0.6 miles on our third loop, we stopped near the Engineers' Gate at 90th Street on the East Park Drive, to take a photo with the statue of Fred Lebow, the namesake of the race. Lebow was founder and first race director of the New York City Marathon. The statue, unveiled a month after his death in 1994, shows Lebow looking down at his watch, timing runners as they pass by. 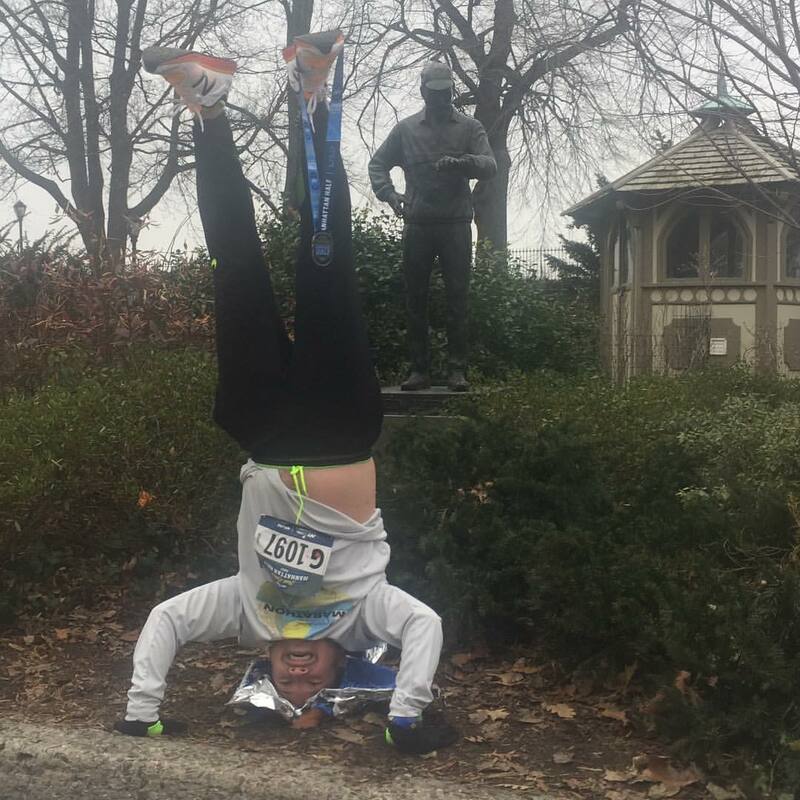 The statue gets moved from its permanent location at Engineers' Gate to the finish line of the NYC Marathon every first Sunday in November. But there, during this race, he was to greet the many runners as we pass by the reservoir. 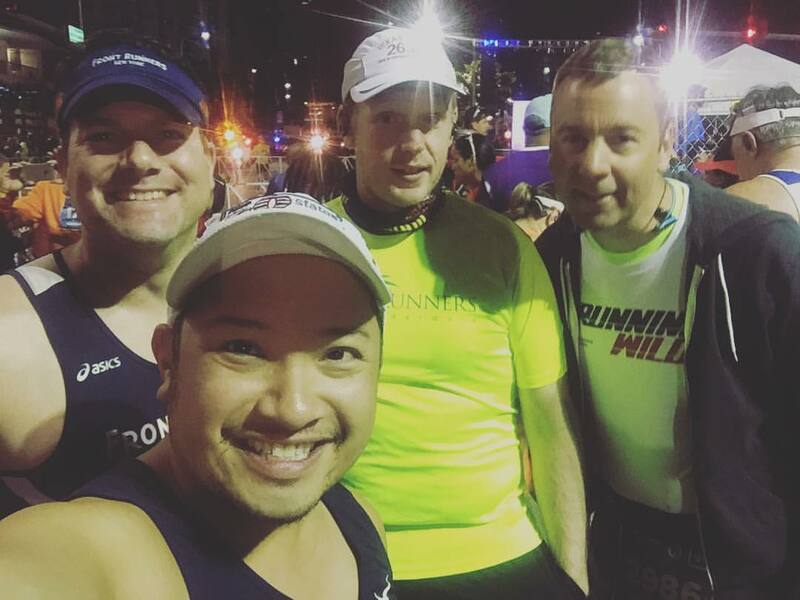 We stopped for a photo, and then plugged in a kick to make it across the finish line strong. 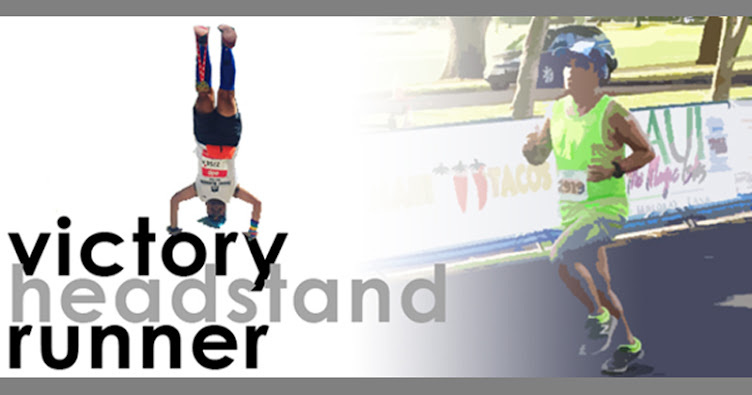 Ryan and I crossed together, and I had a 2:21:44 finish, thrilled to have hit #80 in my city.